Rickenbacker International Corporation - Forum • View topic - Your amplifiers for your RIC! Your amplifiers for your RIC! Post subject: Re: Your amplifiers for your RIC! My Ric is a 650F and I am now on the search for a Ric 12 string. I have gone almost totally digital. When out I use Native Instruments Guitar Rig 5 on a laptop either directly into the PA or into a little Crate MX15R using the clean channel. I have a NI Rig Kontroller that acts as both the effects control and as my AD/DA converter. In the studio I have a custom built computer that includes an M-Audio Delta1010 interface and the NI Guitar Rig software. This setup gives me 17 amp sims, 27 cabinet sims, and over 50 effects. I can stack as many amp/speaker combos as I want and effect chains out the yang. The biggest problem is I spend way too much time fine tuning a sound, however once I find one I like I have total control on it. With all this stuff it wasn't until I started reading this forum that I started to get The Sound out of my Ric. How did I do that? SIMPLIFY! So I owe a HUGE thanks to everyone here! 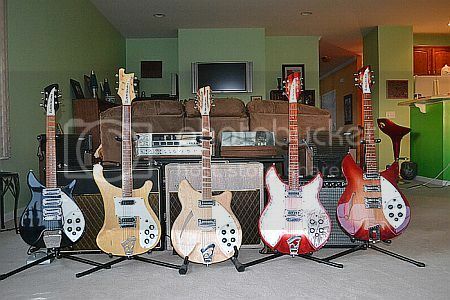 I've been playing Rickenbackers since the mid-80s. During that time I've observed that Rickenbackers sound fantastic with any amp; they're easy to "dial in" with my old Vibro Champ, red knob twin and especially my Dr. Z Carmen Ghia. I cannot say that about my Teles or my ES-335. This past July I bought a 660-12 MG. I recently acquired a 350v63. I use an AC15 with a greenback, and a JC77. I am in heaven. Heaven, I tell you! Does it get any better? A) Seymour Duncan TweakFuzz and Dunlop Crybaby running into the Vox AC4TV mini. C)Boss FDR1 , Danelectro Fab Echo and Fab Delay into a Fender Champion 110 that was modified into a head and powers a Fender 2x10 cabinet (that was a Princeton Chorus) . I recently acquired a Tone King Imperial. It has become my primary go- to amp and it sounds great with both my 1997 and 360/12 CW. The amp's tremolo is the smoothest that I've heard. Prior to receiving the TK, my primary amp was a 2x10 Victoria Victoriette. I still use a Traynor YCV20WR on occasion. Both guitars SING but the 1997 sounds best! Merry Christmas And A Happy New Year to the Rickenbacker players! I got myself a new amp for the holidays! (Thanks mom!) Yeah, it is a Vox AC4C1-BL the blue version and it sounds great with my 1997 360MG. It says it is 4 watts, but I think it is a LOT more. It is much louder than my Pathfinder 10. I think it is a perfect duo for me who plays Beatles. My current Rics played through the following amps. Right now, I'm using a Labseries L5. It's an eighties solid-state with an incredible clean sound. - I use the Blackface amp/cab models for clean. With either a bit of reverb or delay. - I use the AC 30 model, cranked to the gills, for a creamy, distorted lead sound.